ENSO Neutral: ENSO neutral conditions are expected to last through at least Summer 2017. See CPC ENSO discussion and the ENSO tracker in the CLIMAS SW Climate Outlook. 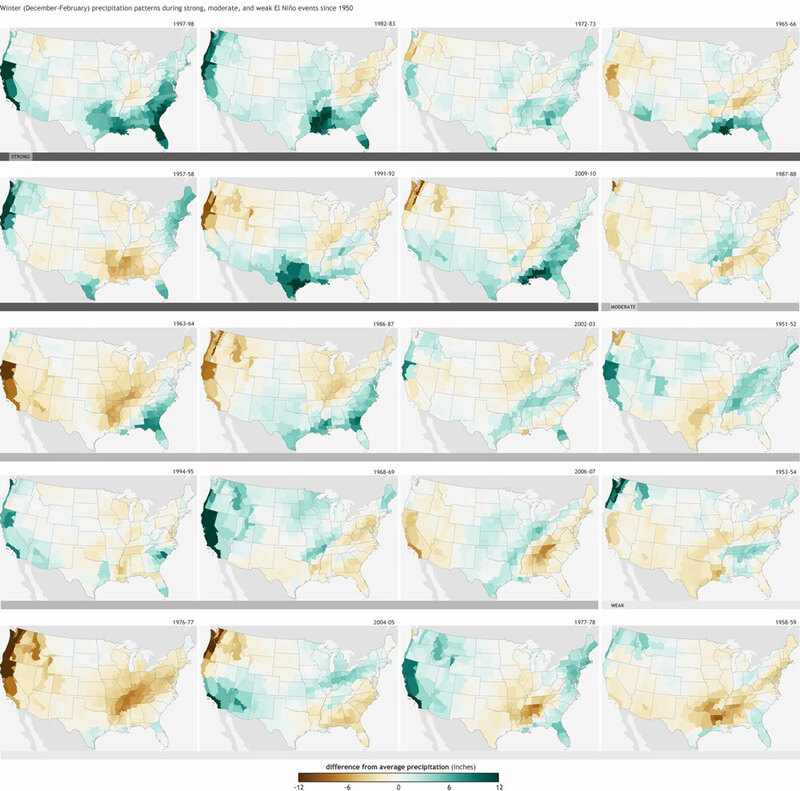 About this Page: This hub is the CLIMAS repository for information, news, and commentary regarding observed and expected El Niño Southern Oscillation impacts in the Southwest (including El NIño and La Niña). Contact Ben McMahan for more information, or with comments or suggestions. What is the El Niño–Southern Oscillation (ENSO)? El Niño and La Niña are part of the El Niño-Southern Oscillation (ENSO), a natural fluctuation in oceanic sea surface temperatures (SSTs) and surface air pressure between the east and west tropical Pacific Ocean. During an El Niño event, easterly trade winds weaken, allowing warmer surface water from the western tropical Pacific Ocean to flow eastward. During a La Niña event, these trade winds intensify, preventing warmer water in the west from moving east, and stacking warm surface water in the west. Large areas of lower surface air pressure and convective precipitation follow the warmer water as it migrates across the tropical Pacific Ocean, altering broad-scale atmospheric circulation patterns (e.g., the Walker Circulation), which can influence weather around the world (Fig. 1). Figure: El Niño events cause the winter path of the jet streams to move over Southwest, usually delivering more winter rain and snow in the region. Image modfied from the National Oceanic and Atmospheric Administration (NOAA). How does ENSO affect SW weather patterns? 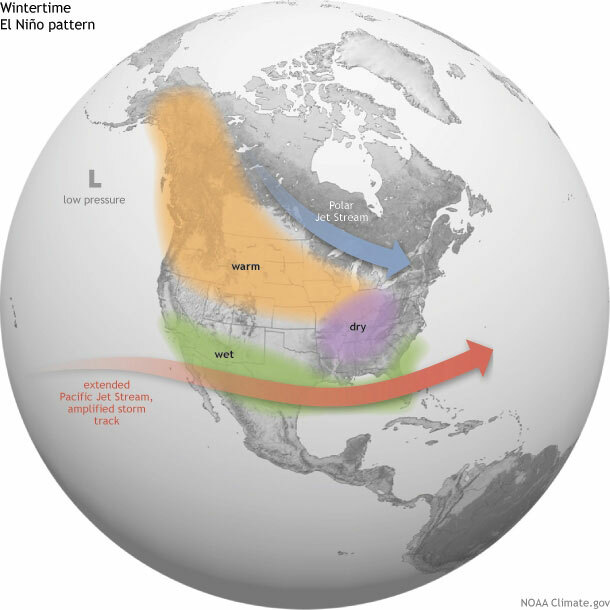 El Niño and La Niña events tend to develop between April and June and peak between December and January, which means the U.S. Southwest sees the most prominent effects of ENSO circulation changes over winter and into early spring. The influence of ENSO on weather in the Southwest is tied to its ability to change the position of the jet stream—the winds aloft that steer storm systems and dictate where areas of high and low pressure are positioned. During El Niño events, the jet stream over the Pacific Ocean becomes less wavy and splits into a strengthening subtropical jet stream near the equator and a weaker polar jet stream, and can result in a greater number of storms and above-average precipitation across the Southwest during winter and early spring. La Niña events often bring drier-than-average winter conditions to the Southwest, as the jet stream curves and shifts north, diverting storms and precipitation away from the region. El Niño does not guarantee a wet winter, just as La Niña does not consistently deliver dry conditions, but these are the patterns most associated with these events. ENSO’s impact on summer weather is less clear, but El Niño events can delay the onset of the monsoon in Arizona and New Mexico by weakening and repositioning the subtropical high that guides moisture into the Southwest. El Niño events also influence development and strength of tropical storms in the eastern Pacific Ocean, and moisture associated with these storms has the potential to deliver above-average rain to the region, typically in late summer or early fall. Precipitation anomalies influenced by ENSO also vary geographically, and the southern regions of Arizona and New Mexico tend to record larger positive precipitation anomalies during El Niño events when compared to northern regions. During La Niña events the general pattern is reversed, with reduced precipitation across the Southwest. 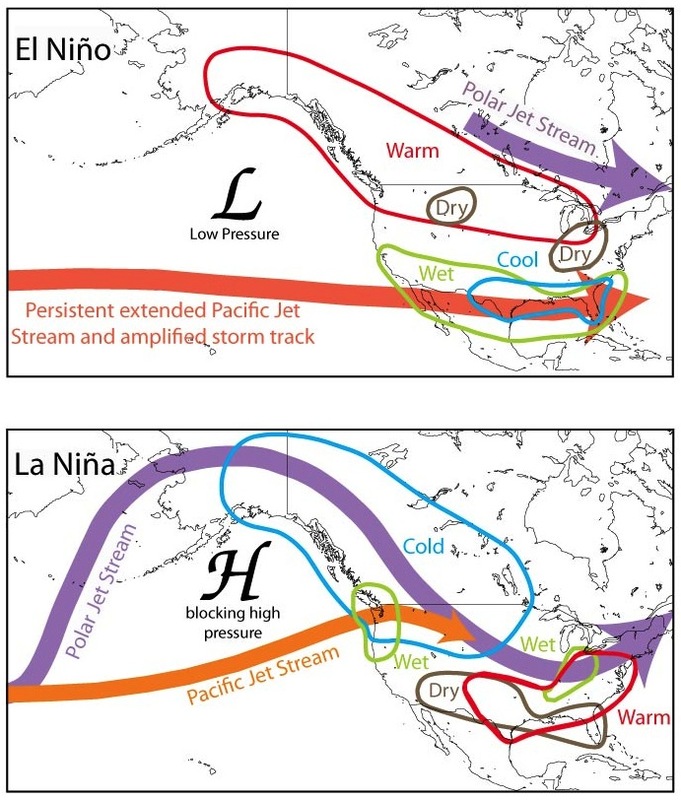 Figure: El Niño and La Niña events cause the path of the jet streams to move over the US in different locations, often causing wet winters during El Niño episodes and dry winters during La Niña events in the Southwest. Image modfied from the National Oceanic and Atmospheric Administration (NOAA). 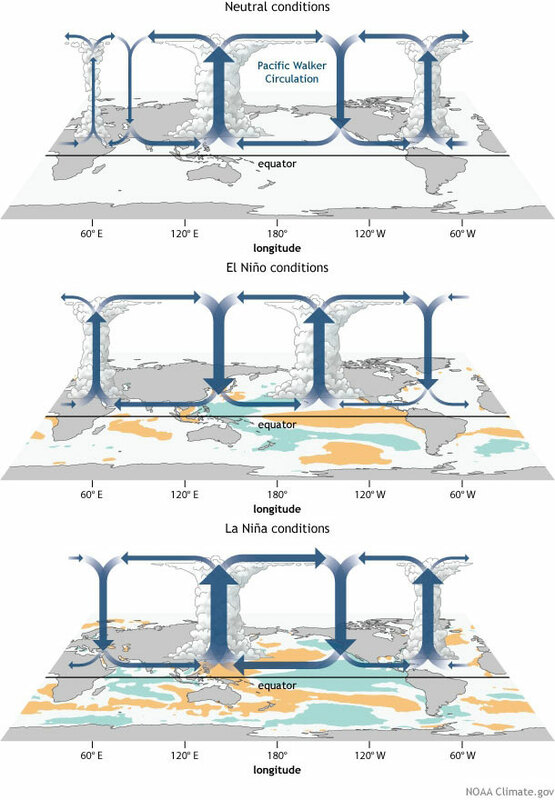 How is the strength of El Niño determined? There are actually several different indices or metrics used to track the state of ENSO (the El Niño-Southern Oscillation) across the Pacific Ocean and whether oceanic and atmospheric patterns reflect El Niño, La Niña or neutral conditions. Some of these indices look just at the atmosphere (for example Southern Oscillation Index), some just at the ocean (for example Niño3.4 index) and some the combination of both (for example the Multivariate ENSO Index). All have different strengths and weaknesses, but oceanic based indices tend to reflect the more slowly evolving part of ENSO, the shift in sea surface temperature patterns, which in turn can have an impact on global weather patterns over many months or seasons. The NOAA Climate Prediction Center uses the Oceanic Nino Index (ONI) which is the running 3-month average of sea surface temperature anomalies (or departures from average) across a key part of the central equatorial Pacific from just west of the International Date Line back towards the east to 120W longitude. How does the strength of El Niño link to observable effects in the Southwest? The strength of an El Nino event does seem to matter with respect to seasonal climate connections here in the Southwest. Looking at past precipitation patterns during El Nino winters of varying strengths, you notice that strong events (ones with ONI values >1.5) tend to have a more reliably wet look to them versus weak events which vary from above-average to even below-average. How much can El Niño help with ongoing drought conditions in the west? The important thing to remember is that we can only expect *some* relief in a best case scenario with a strong El Niño event delivering abundant precipitation across the Southwest over the winter season. Current drought conditions have accumulated over years and cannot be erased by a single wet season. We can look back at drought indices around the time of the last strong El Niño event over the winter of 1997-1998. Wet conditions were observed across Arizona over several months which dramatically improved short-term drought conditions (months to seasons), but longer term drought conditions (seasons to years) were still present and quickly intensified as dry conditions returned the following year. At this point we will need several years of average to above-average precipitation over each season to alleviate long-term drought conditions. An El Niño winter with above-average precipitation would help, but is not a silver bullet at this point. 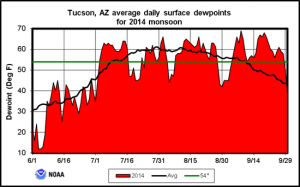 How does El Niño affect the monsoon in the Southwest? Research on the interactions between El Niño events and the North American Monsoon System suggests that during past El Niño events, there was a slowing of the onset of monsoon precipitation across the Southwest U.S. 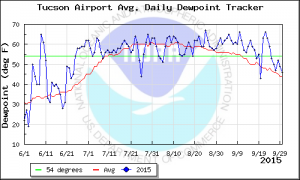 In summer 2015, monsoon moisture moved in ahead of schedule in late June with dewpoints in southern Arizona skyrocketing from the low 30’s (F) in mid-June to above 60F by the end of the month. Abundant tropical moisture was drawn north up into the Southwest as the subtropical ridge expanded and strengthened over the western U.S. Previous research on connections between monsoon onset and El Nino suggest that during strong El Nino events, the subtropical ridge struggles to form early on and delays the onset of the season. This was not the case this year as a moderate to strong El Nino was fully engaged with the atmospheric circulation pattern across the globe. It is possible that strong Madden-Julian Oscillation activity through June helped offset some of the typical ENSO effects on the North American Monsoon early on in the season.